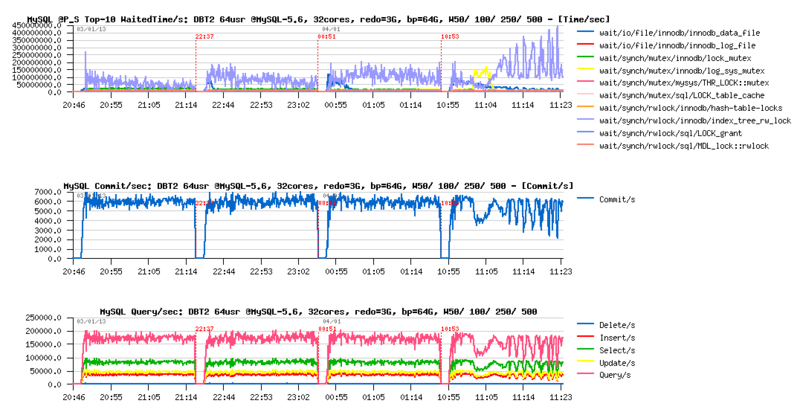 This article was initially planned to follow the previous posts about RW (Read+Write) workloads on MySQL & Linux (part#1, part#2)... But, when I've started to run real MySQL/InnoDB IO-bound tests on the Fusion-io card, I've quickly realized that I'm hitting so hot internal contentions within InnoDB code, that I'm simply unable to use storage capacity on its full power.. So, I've moved to another server (having SSD only), and then continued with it (as to explain RW limits it'll be pretty enough). 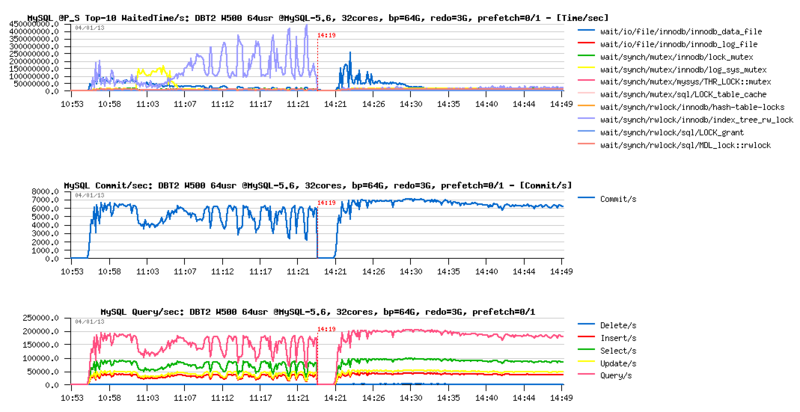 Also, curiously, on this server XFS performance on writes is way better than EXT4 (while on the the previous server XFS got some unexpected problems, seems to be known bugs)..
FS : XFS mounted with "noatime,nodiratime,nobarrier,logbufs=8"
and as seen as the most optimal from the previous I/O testing, MySQL is using O_DIRECT and AIO for I/O operations (mainly write-oriented here)..
What was wrong with MySQL/InnoDB on RO (Read-Only) workloads?.. the main goal here is to bring data pages as fast as possible into the Buffer Pool (BP) to get them cached; and if BP is not big enough to keep the whole active data set -- then adding efficient BP management to remove the most unused pages first when reading the new ones..
the positive thing here that reads in most cases are completely independent between user threads, so all the I/O related activity will most likely depend only of your storage speed..
however, even having all these contentions, it's still possible to keep performance level stable up to 1024 concurrent users sessions and more (see these posts for details) and without involving any throttling (like InnoDB thread concurrency) or special thread management like (Thread Pool extension).. While, thinking well, the use of the Thread Pool is simply the must for any system having a big number of active user sessions -- OS scheduler will simply unable to manage them right (it has no idea who is doing what, who is locking what, who is waiting for what, and so on.. -- most of these things are internal to the MySQL/InnoDB code and not really visible to OS). Then, usually once your number of active threads out-passing x3 time the number of available CPU cores on your server, your CPU time will be very likely spent more and more to simply manage them (OS scheduling), rather to get a real work done.. As well, don't forget that N cores are able to run on the same time only N threads, and not more ;-) So, Thread Pool is really helping here and let you use your server HW more optimally..
Well, and what about RW workloads now?.. but as you're constantly writing, you're very I/O dependent on RW workloads..
with increasing number of concurrent users your I/O activity will be increased yet more faster (more REDO log records, more dirty pages flushing, more purge activity, etc.).. and combined with the increased internal concurrency contentions in the code, you may be even unable to involve the same amount of I/O write requests as on a lower load..
Thread Pool may sill help here to keep contentions level constant..
Let's start with a simple case first..
main bottlenecks here are on InnoDB "index lock" and "lock mutex"
but index lock seems to be the most hot, so it lets expect that using partitioned table, or simple several tables should decrease this contention a lot..
but InnoDB thread concurrency is helping only on 1024 concurrent users load now.. interesting..
and what exactly contention is blocking performance on 250K QPS?.. What is blocking us on 250K QPS ?.. main contentions are on the "lock mutex" and "log sys mutex"
lock mutex contention is dominating..
and the question is: why log mutex is getting a contention?.. - specially how high it's jumping from 32 to 64 users level..
gives impression to be blocked by IO speed on REDO log writes.. - but my SSDs are yet far to be even fully busy% on that moment, so the problem is not really related to I/O... and well, it's not yet the main contention here, so..
Now: What will be changed if instead of 10M, I'll run the same load on the 100M database size?.. 200M? more?.. first of all the volume (of course ;-)) -- and if your workload data set will no more feet the BP size, there will be more and more data reads involved, and finally the whole database activity may become I/O bound, and we'll no more test the MySQL performance, but the storage..
but supposing we have enough RAM and workload data set may still remain cached and SQL queries are not depending on the volume (we're still operating with the same amount of rows in read and write operations within every query).. -- what will be changed then? 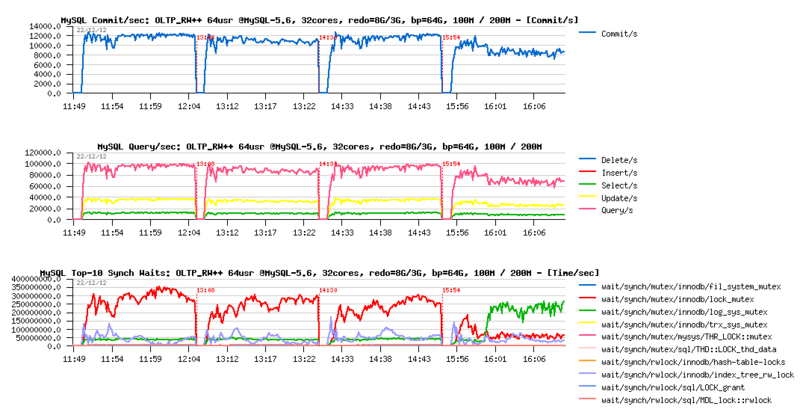 reads related response time should remain the same (of course index trees will be much more bigger, need more operations in access, but as most of the data remaining cached (as we supposed) it should still go on the same or near the same speed)..
while if your access pattern is completely random, writes will become much more wider and will touch much more different data pages! the query/sec (QPS) level may pretty remain the same, and as the results, the REDO logs writes speed too..
however, to follow these REDO log writes will become more harder now, because if on a small data volume there is a lot of chances that by flushing one dirty page you'll match several REDO records corresponding to this page, while on a bigger volume - there is more and more chances that more pages should be flushed to cover the same amount of REDO records..
to summarize: with a growing volume your dirty pages flushing activity will grow too!.. - which will demand to revisit your storage performance hosting data (while REDO writes will remain the same)..
And the question then: Will be MySQL/InnoDB able to follow your storage capacity?.. 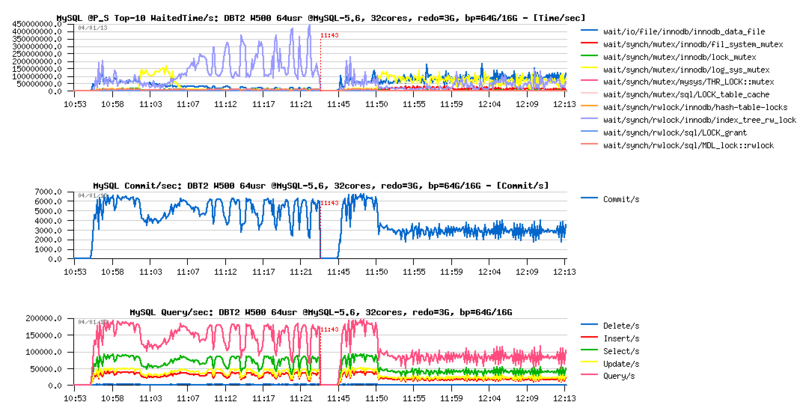 Let's continue with "standard" Sysbench OLTP_RW test, but use now 100M and 200M data volumes. 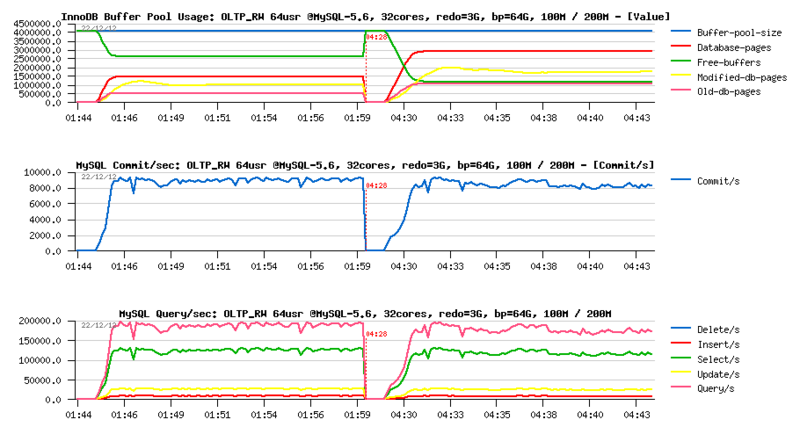 As usually, MySQL Performance Schema (PFS) will help here to analyze wait events + I/O waits too. 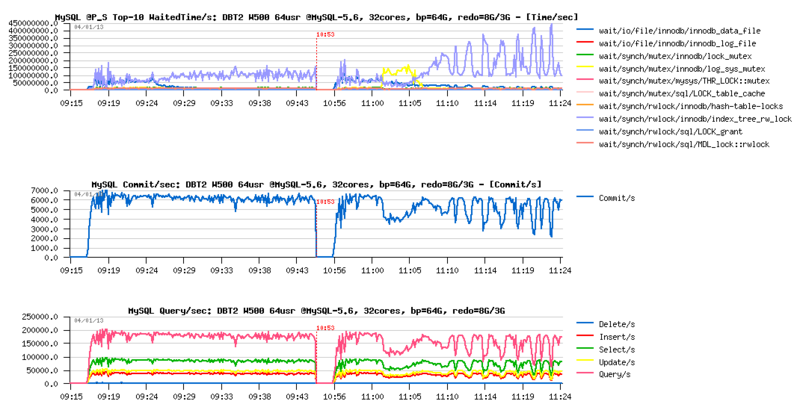 while REDO log write rate remains near the same for both cases..
then, main contention is moving to the lock_mutex (THR_LOCK::mutex wait can be ignored as it's only self-thread lock, not related to the concurrency)..
performance is slightly lower now on 200M comparing to the 100M volume..
and what is interesting within 200M case: the flush avg page rate (red line on the graph) is no more matching the real pages/sec level (blue line).. - why? -- in fact the "avg page rate" is calculated internally within Adaptive FLushing code regardless the real flushing page/sec rate and indicates what should happen according Adaptive Flushing expectations (all requested writes should be finished during expected time); so, when it's not happening, and we're observing a deviation like here, it means that storage I/O level is unable to follow the write requests coming from InnoDB..
And, of course, the main question since then is it really because of the storage the flushing rate is unable to follow the requested speed, or there may be some other reasons as well?.. 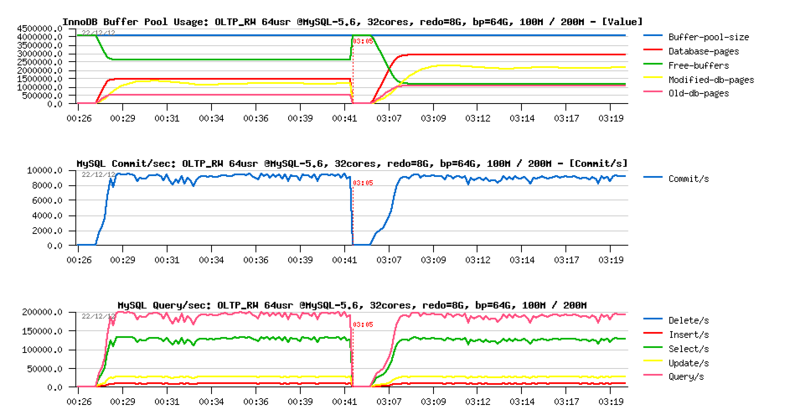 well, there is no really any difference between 100M and 200M test case..
but probably it's more different from the previous test with 8GB REDO logs?.. hm.. all 4 tests are looking exactly the same..
maybe we're simply missing some critical instrumentations here? first of all you may see that we have a problem here: there is no reason to scan 200K pages/sec to flush only 5K pages/sec!.. so, we have here the first problem to fix..
in fact this is related to the InnoDB design, and coming from a long date now: the flush list is supposed to be accessed concurrently, and in some situations the "previous" pointer in the list may become no more valid, so the flushing code should to rescan the list from the tail again to find next pages to flush..
the fix is not trivial, and may require some in depth remastering of the code..
then, the real improvement will come once a parallel flushing will be implemented in 5.7 !.. The following graphs are reflecting the changes. 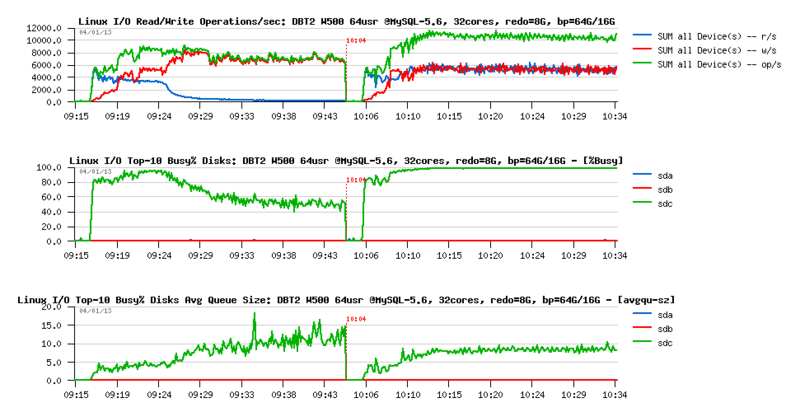 interesting that with 8GB REDO logs space both test cases (100M and 200M) having the same level of performance (and you may remark the higher number of commit/sec comparing to the previous tests, so even QPS is lower, we're writing much more now, see also the Updates/sec level)..
curiously the 10K pages/sec flushing level is looking here like the I/O border limit.. (while it's not really possible, as my SSD(s) are able to do more (verified before)..
100M case is yet more interesting: we're fine with a flushing speed here, lock contentions times are not higher than with 8GB REDO, but performance is lower.. - why? - the answer is simple: each involved I/O is representing a cost + combined with lock_mutex contention resulting in performance decrease.. As well, I'm pretty sure that lock_mutex contention here is also having its effect on deviation of the flush_avg_page_rate, needs to be more investigated.. PROBLEM #2 : lock_mutex contention - Well, this one is just needed to be fixed ;-) (and I've also started this article by observing this contention - seems to be one of the next hot bottlenecks, depending, of course, on a workload). And what is changing when we're short in memory? and instead of 64GB may allow only 16GB Buffer Pool size?.. keeping in mind a low Checkpoint Age, we may already suspect performance regression (lower REDO write rate may only mean lower transactions rate)..
performance is something like x5 times worse now.. But well, this workload is exactly the case when only faster disks may help you or using/buying more RAM (as you saw, with 64GB pool the result is x5 times better, while finding here yet more faster disks than SSD would probably not help as much)..
Then, to finish the story, let's replay something similar also on the DBT2 (very similar to TPCC-like) workload. same here, up to W500 volume all things are looking pretty well..
looks like on the beginning the flushing rate is stuck on 5K pages/sec level and don't willing to grow even we're requested up to 20K pages/sec to flush! (look on the green line with flush "requested" and blue line with adaptive total pages/sec )..
which is leaving Checkpoint Age growing unprotectedly, reaching 2500M critical level, and involving sync flushing (and sync flushing waits)..
Let's focus more closely on the W500 case then. We may easily expect that with a bigger REDO log size we will avoid sync flushing waits at least, but will it protect the workload from the QPS "waves" due mutex lock contentions?.. seems like it's very directly depending on the index lock contention..
as well there is no more log_sys_mutex contention, as expected: 8GB REDO space is big enough here to leave more marge for flushing on the test startup (note: on W1000 or W2000 volume it may be not enough again, depends on contention and storage performance)..
but well, if index lock contentions are workload related, then we should also observe them on the 8GB REDO test too, right?.. the feeling I have that the "waves" we observed are related to some I/O related limits.. We're hitting here something..
however, the level of I/O operations rate is remaining pretty constant and has no such "waves"..
so, why the "waves" are coming?.. but the number of executed I/O operations remains the same.. - what does it mean? it may mean only that only a part of I/O requests from the queue was executed on time, and some of them may wait longer! however, OS is reporting that avg I/O service time (response time) was stable and around 0.3ms.. - but probably it's only because of writes?.. Bingo! if there is no any big waits on write operations, there are pretty important waits reported on reads! 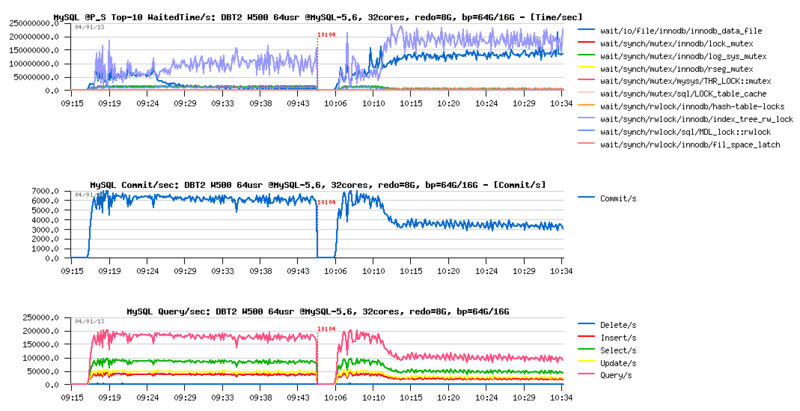 note that times are reported here in usec, means we have some spikes up to 35ms on reads... - hard to believe (specially when SSD is used), but cannot be ignored in any case (while probably a more detailed instrumentation is needed here to understand the problem better).. However the question here is what is a main and what is a result event? do we have index lock "waves" because of the overloaded I/O queue? or because of index locks we're involving I/O requests in "burst" mode wave by wave?.. QPS level is just stable like never! and what is completely incredible: index lock waits are disappeared!.. - how it's even possible?.. 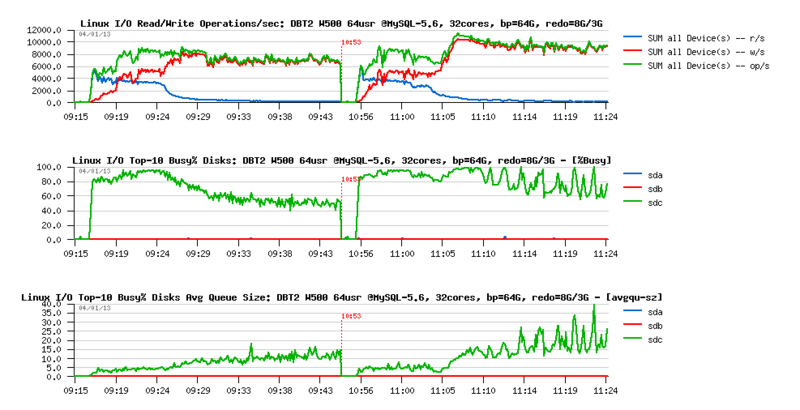 another surprise: flush rate is the same 10K pages/sec (again 10K? ;-), but avg page rate is deviating now..
the flush scanned pages/sec rate increased from 300K to 400K, but may 100K more scanned pages/sec explain deviation? seems to me until we'll not get it fixed, we'll not have an answer..
while I/O queue is out-passed 50 I/O operations and not jumping anymore..
Did we increase some I/O waits reported by PFS? wow! avg read time is increased a lot on some of the data files! seems to me here too a proper fix for index lock contention will really help a lot! And what PFS is saying about I/O waits on the REDO log files? interesting that I/O activity did not change.. -- do we really reaching the I/O limit? -- I still have impression that wait are coming not because we're hitting the I/O limitations.. - seems to me I have to trace the wait events yet more in depth..
Well, let's not forget the test case when Buffer Pool was reduced from 64GB to 16GB. What we'll have on DBT2 W500? 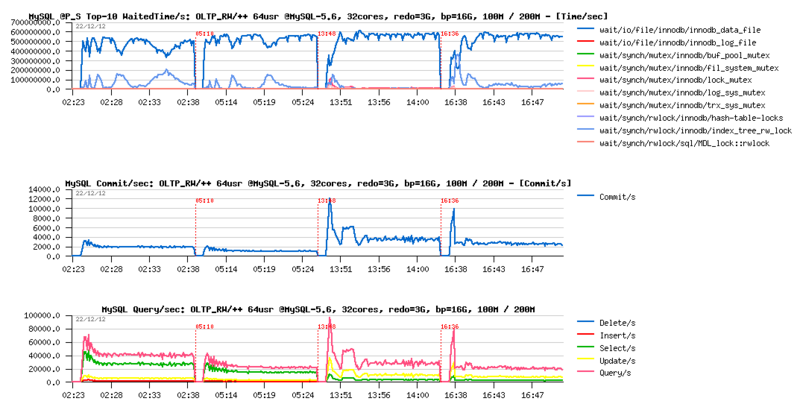 ok, performance is x2 times worse (but only x2 times, so better than on Sysbench, once again confirms that regression depends on a workload)..
however, the REDO log size is really small here, as over all test duration the log_sys_mutex contention is on the top waits position.. NOTE: since MySQL 5.6 there is an option in InnoDB to tune the LRU scan depth (innodb_lru_scan_depth) to improve LRU flushing and make user thread waits mush shorter, but in the current test case it did not help due very intensive I/O reads.. While there is some mystery flying around current RW limits in MySQL, the one thing you can be sure: if your InnoDB "buffer_flush_avg_rate" constantly out-passing your "buffer_flush_adaptive_total_pages/sec" then you're hitting some limits on your dirty pages flushing! then, if you're observing "lock mutex" or "index lock" (or other) contentions during your test or production workloads - please, bring us your details, it'll help us to fix them in the most optimal way (and not keeping in mind only our test cases)..
well, MySQL 5.6 has already a lot of performance improvement, but yet more are waiting for us again to be done..
some will be fixed in MySQL 5.6, some will be fixed only in 5.7..
but well, be sure we're taking all of them seriously, and working on them..